How to get from Cusco to Ollantaytambo? Ollantaytambo is often visited by tourists heading to Machu Picchu. To get there from the city of Cusco, you will cross the Sacred Valley of the Incas by bus or train. This Inca ceremonial fortress and center holds as many attractions as the Wonder of the World, so take your time to get to know it better. Is it worth visiting Ollantaytambo? How do I get from Cusco to Ollantaytambo? How much does it cost to get to Ollantaytambo? How much does it cost to get there via the Chinchero route? How much does it cost to get there via the Pisac route? How to get to Machu Picchu from Ollantaytambo? What to do in Ollantaytambo? Where to sleep in Ollantaytambo? What to eat in Ollantaytambo? Ollantaytambo was a ceremonial center during the time of the Incas. This historic place served as a checkpoint for people who toured the Sacred Valley of the Incas. It also served as an operations center during the Inca resistance at the time of the Spanish invasion. Today, Ollantaytambo is considered one of the most impressive places in South America. Its Inca urban design has been preserved since the 13th century. Its archaeological site has incredible constructions such as Machu Picchu. There are restaurants and first class hotels there. Ollantaytambo is located in the Sacred Valley of the Incas, in the current province of Urubamba (Cusco). It is located 2,792 meters above sea level (msnm), almost 60 kilometers from the city of Cusco. The town sits next to the Urubamba River. From this town, trains depart in the direction of Aguas Calientes (Machu Picchu town).. There are 2 ways to get to Ollantaytambo: one to the north through the town of Pisac and another shorter to the south, through the town of Chinchero. To travel this route you must take the buses on Puputi S / N street in Cusco. The cars pass through the town of Pisac and arrive in Calca. The trip takes approximately 1 hour and 20 minutes. After Calca, you should take a car to the town of Urubamba (30 minutes). Finally, you must board a bus from Urubamba to the town of Ollantaytambo (30 minutes). These cars reach the Main Plaza of Ollantaytambo (with an intermediate stop in the town of Urubamba). The trip takes approximately 1 hour and 30 minutes. You can get to Ollantaytambo by train. However, the cost may be somewhat high for most people. If you are in one of the towns of the Sacred Valley, you can take the buses to ‘Ollanta’. Getting to Ollantaytambo is not expensive. The cheapest way to get there is by the short route (Chinchero route). In Ollantaytambo there is the train station from where most tourists depart in the direction of Machu Picchu. The train trip lasts approximately 2 hours (30.5 kilometers away). The final destination is the town of Aguas Calientes. In Aguas Calientes (also called Machu Picchu town) the buses leave in 30 minutes to ascend a steep mountain to the entrance gate to the Wonder of the World (9 kilometers away). Train tickets (from Ollantaytambo to Machu Picchu) must be booked online and in advance. Inca Trail: Only 15 kilometers from Ollantaytambo is the ‘Km 82’, the starting point of the famous Inca Trail. This adventure takes us to Machu Picchu in 4 days and 3 nights. It is considered one of the 5 best hiking trails in the world. Tickets must be booked online and months in advance. Route through Santa María: 119 kilometers from Ollantaytambo (2 hours by car) is the town of Santa María. From this place you get to Machu Picchu by the so-called ‘Hydroelectric’ route. This alternative path is longer but it includes hikes and adventures. Ollantaytambo is magical. It conserves the straight streets of the Inca period. Where the inhabitants live today you can see the Inca walls of the original houses. On one side of these small streets you can see Inca channels that currently supply the town with crystal clear waters. There you will feel at times that you go back hundreds of years to the past. Ollantaytambo was a ‘tampu‘ (hostel) for the Inca nobility. After the Spanish invasion the town was rebuilt on the original layout. Among the most impressive structures of the enclosure you can see the Sun Temple. In the town of Ollantaytambo you can enjoy its streets, its landscapes and its people. In your square you can observe the locals coming down from nearby communities with colorful traditional costumes and hats adorned with multicolored flowers. The Pincuylluna hill is located in front of the Temple of the Sun of the Ollantaytambo fortress. If you decide to climb the mountain, you can see structures of stone blocks superimposed with 6 windows of facades and 6 windows called ‘colcas’ (Inca warehouses). CATCCO is the abbreviation of “Andean Center of Traditional Technology and Culture of the Communities of Ollantaytambo”. There are exhibited samples of architecture, craftsmanship and beliefs of the villagers. Try mountain biking at the Abra Málaga. There it will descend around 1,500 m. (5,000 ft.) There you will get exceptional views on a tour that has been described by many as one of the most beautiful in South America. In Ollantaytambo you can also take a horse and go to the Inti Punku viewpoint (Puerta del Sol). 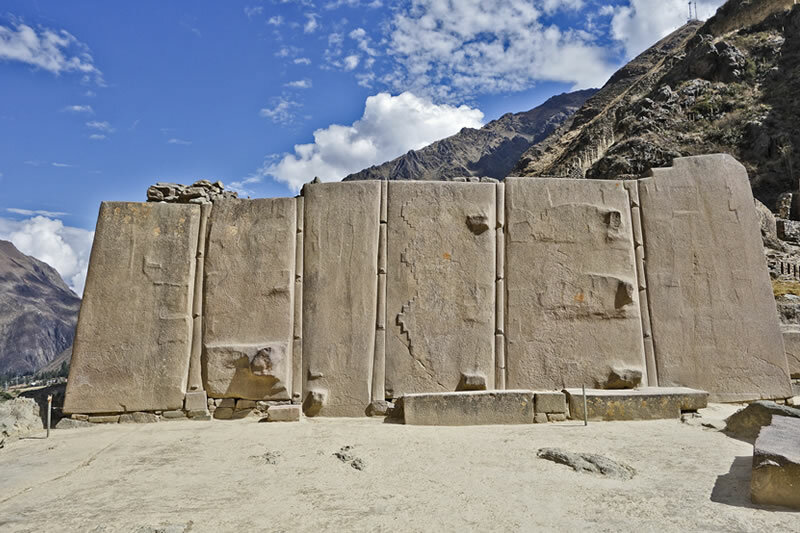 In the tour you will see archaeological sites and you can learn more about the Inca culture. The tour lasts around 8 hours round trip. 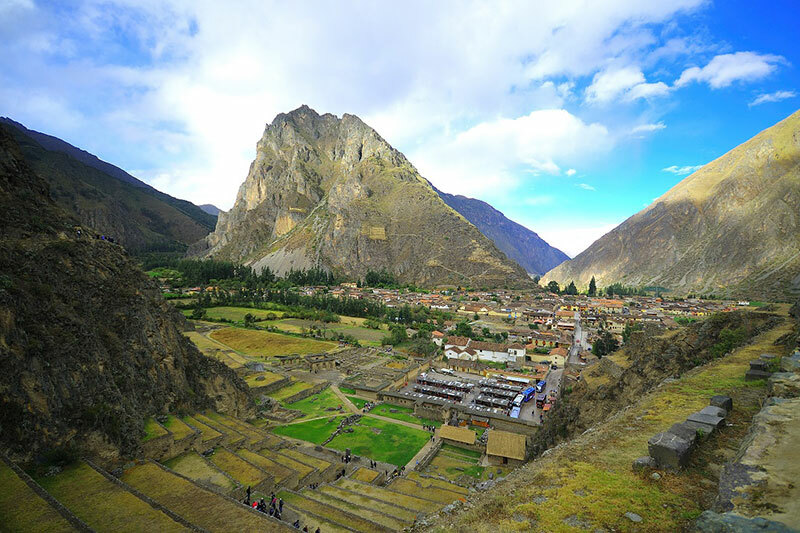 Ollantaytambo is a must to get to Machu Picchu, which is why a medium-sized tourist plant has been developed. There you can find hotels from 1 to 4 stars. If you wish, you can spend the night in Ollantaytambo after visiting the Sacred Valley of the Incas and, the next day, you can take the train to Machu Picchu. In Ollantaytambo, there are more than 50 restaurants of different categories where you can have breakfast, lunch and dinner. They have pizzerias, bars, coffee-bars, restaurants of Peruvian food and others. All establishments serve quality food. Ollantay … what? The correct pronunciation is / Oy-yahn-tie-tahm-bo /. It may be difficult at first. However, once mastered it sounds pretty good. The places simply say “Ollanta” / Oy-yahn-ta /. Ollantaytambo is called ‘Fortaleza’ because there was fought in 1537 a tough battle between the rebellious Incas and the Spanish invaders. Ollantaytambo is the scene of a drama of Quechua origin and unknown. According to the story, the Inca general Ollantay is punished for wanting to marry the daughter of the Inca Pachacutec. Currently, Ollantaytambo celebrates the Ollantay Raymi Festival, a staging of the drama ‘Ollantay’. The staging is in Inca archaeological sites and takes place at the end of June. ← How to buy the Ticket Religious Circuit Cusco?